Are you a person who loves to do woodworking projects but often gets frustrated by the lack of strength in the joints you make in two pieces of wood? Well then investing in a good biscuit joiner will most certainly take away most of your frustrations and concerns with the strength of the joints you make. How can this power tool with the strange sounding name help you? 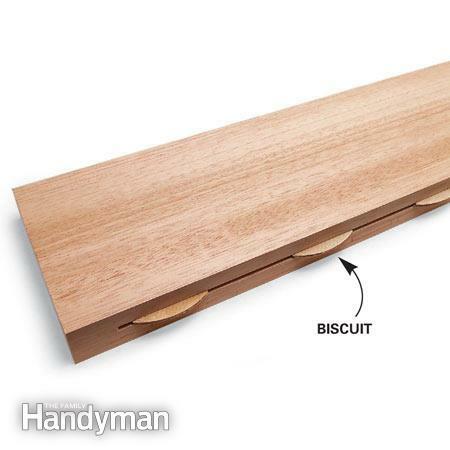 The best biscuit joiners make symmetrical notches in the end or sides of a piece of wood so a small football shaped piece of wood (called a biscuit) can be inserted in this notch to help join two pieces of wood together. Many tool companies make biscuit joiners but not all of them work well. That is why we will take the time to review 5 of the top biscuit joiner models and give you some more information on these handy machines that will help you join two pieces of wood together in a much stronger way. Here is what we feel are the best biscuit joiner power tool models you will find in the tool marketplace. We will provide you with more detail on them in this article after the buying guide section. As far as biscuit joiners go you tend to get what you pay for. In most cases the more you spend on a biscuit joiner the higher quality a power tool it will be and the more features that it will have. Be aware though at the same time there are some sales where you can pick up an excellent model biscuit joiner at a bargain price. One thing that is very important for any biscuit joiner that you buy is to make sure it has adequate power to do the job. That is why it is important to look at both the amp draw and RPM’s that any model biscuit joiner you are thinking about buying has. A higher amp draw generates more power and a higher RPM speed enables you to cut your biscuit grooves into a piece of wood faster. One of the most important pieces of equipment on any biscuit joiner is its fence that is located on the front of it. It serves as a guide for the saw blade when it cuts groves into a piece of wood. The best fences allow you to set them in multiple positions and at different angles. This is great because the more versatile your biscuit joiners fence is the larger the number of different type grooves you can make with that biscuit joiner model. Generally speaking the larger size biscuit groove you can drill with a biscuit joiner the bigger size pieces of wood you can join together. So look for a biscuit model joiner that will allow you to cut grooves for a large assortment of biscuit sizes. The size of the grooves your biscuit joiner can cut is not the only thing that determines what size biscuits you can use to join two pieces of wood together. Another important factor is the depth of the groove. You definitely want any model biscuit joiner you buy to be able to be set to cut various different groove depths. You want the model biscuit joiner you buy to be easy to use too. Look for one that advertises it has an ergonomical shape that makes it easy to run for long periods of time without getting tires. Easy to work control settings and rubberized grips also will add to your comfort as you use a biscuit joiner. A biscuit joiner cuts in a way that throws the wood chips and dust in a backward direction. For safety and tool longevity reasons you will need a way of catching those cutting fragments efficiently. That is where a good dust collection system is important to have on any model biscuit joiner you will purchase. So get a biscuit joiner model with an adequate dust collection system that includes an easy to empty catch bag. Any power tool that you use for woodworking will be undertaking tasks in a somewhat harsh environment. There will be dirt, dust, oils and other contaminants that can start to break down your biscuit joiner if it’s not constructed out of quality materials. Look for a biscuit joiner model that is made out of such things as sturdy polymer plastics, corrosion resistant metal and other materials that will ensure it lasts you a long time before needing to be replaced. Biscuit joiners are not inexpensive power tools. Since that is the case you want to get some protection in the form of a warranty from the manufacturer when you purchase one. Try to find a biscuit joiner that has a warranty of at least 1-year or better and also make sure that warranty covers the entire biscuit joiner not just some parts of it. A good warranty will give you peace of mind that if your new biscuit joiner fails in an unreasonable period of time then it will be replaced. If you are a serious woodworker or you do woodworking professionally then you may just want to add this high quality biscuit joiner to your tool collection. You will find few tools that are made so they are this high quality. This power tool from Lamello has the type of versatility you love in a biscuit joiner. The fence on it has several preset stops and adjusts to any angle between 0-135°. There are also very few biscuit joiners made that will cut 12 different size biscuit grooves like this model does. You can even cut 45 degree grooves into wood using this power tool if you want. It is slightly to the noisy side but all that power makes it a very acceptable tradeoff. Lamello has installed a nice 7 amp/10,000 RPM motor on this model biscuit joiner to help it cut fast and clean. The manufacturer also backs this model biscuit joiner up with a full 1-year warranty. DEWALT is a big name in power tools and products like this high quality biscuit joiner are the reason why. If you want to strongly join two pieces of wood together this is the biscuit joiner model you want. It’s well-designed, cuts accurate biscuit grooves and is also very easy to use. This biscuit joiner features 6.5 amp/10,000 RPM power that will help you make quick and accurate grooves for inserting wood joining biscuits. It’s built tough using parts that are made out of such things as corrosion resistant aluminum alloys and sturdy polymer plastics. This biscuit joiner weighs only 6.6 pounds too. The best thing about this product is its highly adjustable fence that enables you to make very accurate biscuit groves. It features a dual rack and pinion fence and even has preset stops built into for convenience. 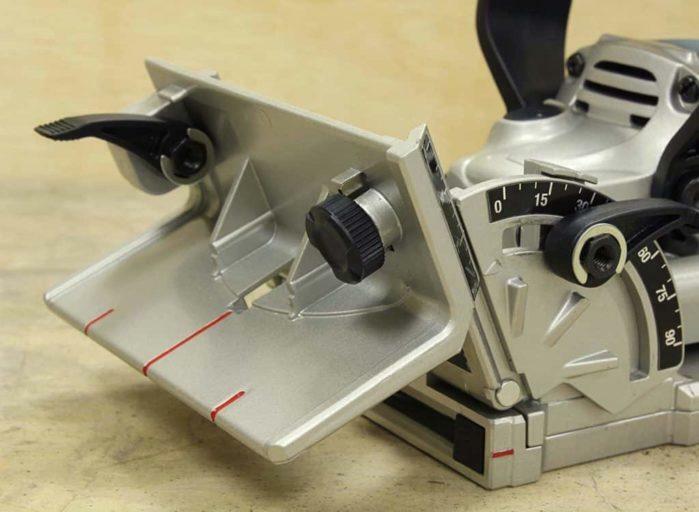 This biscuit joiner can help you make 45 degree notches easier too. DEWALT stands behind this product by offering those who purchase it a 90-day money back satisfaction guarantee and a 3-year limited warranty. 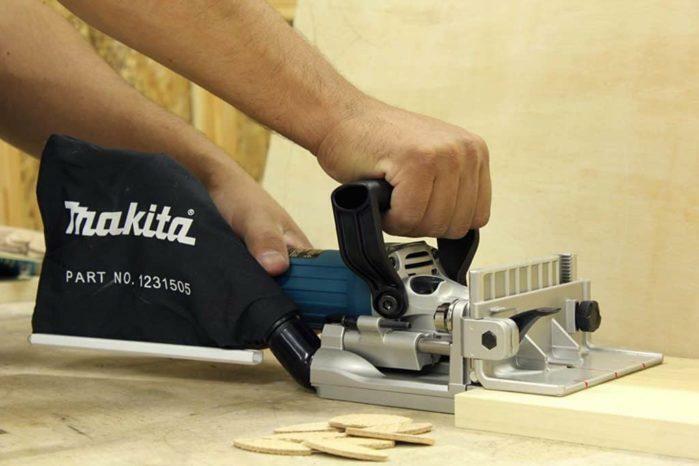 Makita is another very popular power tool maker. This biscuit joiner from them definitely belongs on this list of the top model biscuit joiners in the power tool marketplace. It makes precise and clean grooves that will enable you to easily join two pieces of wood together using football shaped wood biscuits. This biscuit joiner has some amazing power that generates over 11,000 RPM’s of cutting speed. That is enough speed to make any biscuit joining groove in a hurry. The best thing about this biscuit joiner is how simple it’s to operate. Everything from the cams you use to set the fence angle to the depth stops are very easy to operate. Even the thin shape of it makes this biscuit joiner easy to hold while operating it. It has a cast aluminum front body and the motor is nicely double insulated which helps promote long life. Makita backs this fine power tool up with a full one-year warranty too. Here is a very nice model biscuit joiner from porter cable. It is obvious this reputable tool company put quite a bit of thought into the design of this product. It’s easy to set up and it cuts very precise grooves for inserting joining biscuits. This model biscuit joiner is nicely powered and generates a 10,000 RPM cutting speed to help make quick biscuit joining grooves. Porter-Cable has designed a biscuit joiner that not only cuts grooves fast but should also last a long time thanks to its high amp rating. Its 7.0 amp motors tends to run cooler when operating to help extend its motor life. It’s a model biscuit joiner that gives you lots of versatility too. There is a fence that easily adjusts to several different angles and it also has seven different cut settings. The trigger will even lock in place for extended cutting so you don’t get tired as easy while using this nice power tool. If you are on a budget yet still would like a nice biscuit joiner to help you with woodworking projects this may be the perfect model for you. Gino development has come up with a biscuit joiner model here that works well and is very affordable. This is a very functional biscuit joiner kit that even includes a 4” Tungsten carbide tipped blade. It features very good power (8.4 amps/11,000 Rpm’s) for make quick grooves to install biscuit joints in. It weighs only a little over 8 pounds which makes it somewhat easy to handle and it has a dust collection system that works better than most too. This is a lighter duty type biscuit joiner. It is better suited for individual use for someone that just wants a budget priced biscuit joiner for occasional use. In all reality any of these biscuit joiner models would make a great addition to your power tool collection for woodworking. They all are full of extremely well-designed features that help make the biscuit joining process go very smoothly. We have to say that when we compared price, function and ease of use the DEWALT DW682K 6.5 Amp Plate Joiner. This model biscuit joiner is high enough quality for even professionals to use yet affordable enough that any serious woodworker should consider it too. There are so many different fence, depth and groove width settings on this power tool that you will find few biscuit joiners that give you as much versatility as this one. This DEWALT biscuit joiner has a rack-and-pinion fence system that helps you make accurate cuts and adjusts at several different angles. It’s built out of quality materials and backed up by a full 3 year warranty also. This truly is one of the best biscuit joiners you can buy and should truly be considered for purchase if you are in looking for a new biscuit joiner model to add to your power tool collection. Property Q & A: What Year was My House Built and How to Determine It?